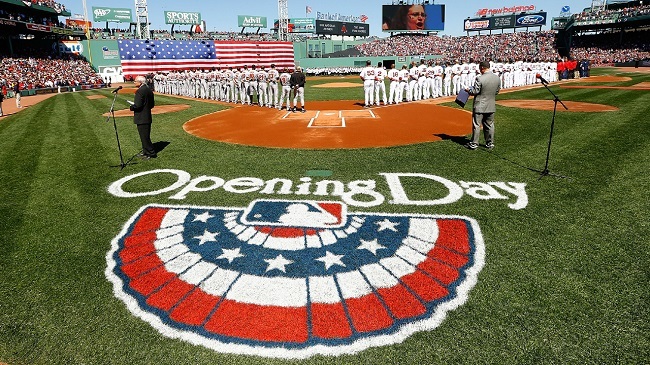 The 2018 MLB Opening Day was a full day of exciting baseball all around the league and for some teams it was a great start to the new year, but for other teams it did not go as planned. The Miami Marlins, if going by our staff predictions alone, are set to lose over 100 games and even though they gave the Cubs an early battle, they succumbed to what will seem to be a daily even, a tough loss. If looking at a bright spot for the Marlins, Derek Dietrich (2 for 3) and Brian Anderson (2 for 3, 2 RBIs), helped keep Miami in the game, and RHP Junichi Tazawa tossed two scoreless innings, allowing no hits, one walk and struck out two batters. As for Chicago, they are just too strong as Ian Happ, Anthony Rizzo, and Kyle Schwarber all went deep to help secure the victory. There is no doubt in most baseball fans minds that the Houston Astros will win the AL West Division and they started on that path on Day 1, with a well-earned victory showcasing power and pitching. George Springer started where he left off from the 2017 World Series, as he hit a lead-off homer to put the ‘Stros up 1-0, and they would never look back. On the Mounf Justin Verlander was just as dominate as he was in the Fall Classic as he tossed six shutout innings, allowing four hits, two walks and struck out five to earn his first victory on the season. As for the Rangers, Cole Hamels tried to match his counterpart, but he allowed three runs over 5.2 innings, walking four and striking out seven. Entering 2018 the Yankees look to be the best team in the AL East with probably one of the most feared line-ups in baseball and even though manager Aaroin Boone didn’t go with his wacky idea of leading off Aaron Boone, he did bat him second and Giancarlo Stanton second and what resulted was Stanton sending two moon shots to open the season with his first two homers. As for fellow slugger Judge, he had a two hit game, singling and doubling in the opener. The Yankees managed 11 hits, led by Stanton’s three hits and spreading the love throughout their dangerous line-up. On the mound, Luis Severino gave the rotation a great start, as he tossed 5.2 shutout innings, allowing just one hit, three walks and struck out seven. The Blue Jays did manage to get on the board in the 8th, on Kevin Pillar‘s first home run of the season off relief pitcher and Dellin Betances. I decided to throw this game in the group of teams expecting to win their opener because I expect the Brewers to battle the Cubs for the NL Central crown, and they didn’t disappoint on opening day. It was a pitchers duel as starters Chase Anderson – Brewers (6 IP, 1 H, 0 R, 3 BB, 6 K) and Clayton Richard – Padres (7 IP, 6 H, 1 R, 1 BB, 4 K) kept both teams locked in a battle throughout the whole game. The Brew Crew did strike first with a run in the third as newcomer Christian Yelich singled home his first Brewers run, putting his team up early 1-0. With victory within their grasps, Corey Knebel blew the save opportunity giving up a game tying hit to Freddy Galvis, as Matt Szczur scored ahead of the single. But the Brewers would not be denied victory as they scored a run in the top of the 12th and Jacob Barnes shut the door for the first of many Milwaukee wins on the season. Right now they are tied with the Cubs for first place at 1-0. Only because the expectations of what the season means for the Mets after all the off-season acquisitions and the return to the mound for Noah Syndergaard, this game was a needed and mostly expected victory for he Mets, but it did not start as planned. Syndergaard dominated, as he struck out 10 batters, but he also was human, as he gave up four runs on six hits over six innings, while also allowing two long balls to leave the park. As for the Mets offense, it was led by an unlikely source, but one player that I have felt for a long time would be a great MLB ball player, Brandon Nimmo, who batted lead-off and finished 2 for 3, with two runs scored, and a walk. The Mets put up three early runs, then exploded for five in the fifth, led by Yoenis Cespedes (2 for 5, 3 RBIs), Jay Bruce (1 for 3, RBI), Adrian Gonzalez (2 for 3, 2 BB, RBI) and another one of my favorites that should become the everyday catcher, (Kevin Plawecki, 2 for 3, 2 R, 2 BB, RBI). The Cardinals did make it interesting, adding two in the second and one in the fourth and sixth, but they could not overcome the Mets explosive offense and strong bullpen led by Robert Gsellman who struck out all three batters he faced in the seventh inning. A good start for the Mets and first managerial victory for skipper Mickey Callaway. The Boston Red Sox are most likely going to battle the New York Yankees for tops in the AL East, but it didn’t start out in their favor as they allowed the Tampa Bay Rays, a team that has always been a thorn ion their side to steal away game one. The Red Sox put up a three-spot in the second led by an inside the park, two run home run off the bat of Edwin Nunez. Then they added a run in the seventh to take what would seem to be a commanding lead heading into the later innings. But the Rays had others plans in place. A six-run eighth inning, as Matt Duffy doubled home a run, Brad Miller walked in one, newcomer Denard Span tripled home three and Adeiny Hechavarria singled home the last, to put the final on the Rays upset victory. Red Sox starter Chris Sale did his part tossing six shutout innings, allowing just one hit, three walks, while striking out nine batters, but the bullpen fell apart allowing the Rays to steal the game. This game will be one that shocks many, but maybe not our own Jake Berry, but the Braves were not picked to do much this season, but they proved many naysayers wrong as they battled for six late inning runs to steal away game one from the Phillies. Philadelphia took an early 1-0 lead in the first on an RBI double from Rhys Hoskins. Then both teams pitchers shut down the bats with five scoreless frames until the top of the six when the Phillies added four runs to take a commanding 5-0 lead. But the Braves started their unlikely comeback with two in the bottom of the frame, then three in the eighth and three in the ninth to a walk-off victory. The Braves managed only one hit per batter, but they made that contact count as Freddy Freeman, Ozzie Albies, and Nick Markakis all homered. Great start for a young Braves team looking to get back to their winning ways. Probably one of the most shockers from day one, was the Giants taking down the mighty Dodgers lineup and Ty Blach out dueling Clayton Kershaw to help lead his team to an unlikely victory, even after San Fran lost two key starters before the season even started. Blach stepped in for injured Madison Bumgarner in a mighty way and the Giants managed one run off Kershaw to steal the victory. Kershaw was not as dominate as he was in spring training, but he did pitch a good game walking just two and striking out seven, even though he allowed eight hits over the six innings. The lone run came on a Joe Panik home run in the fifth. The most hyped and anticipated player we have seen in the league in a while Shohei Ohtani earned his first MLB base hit in five plate appearences.